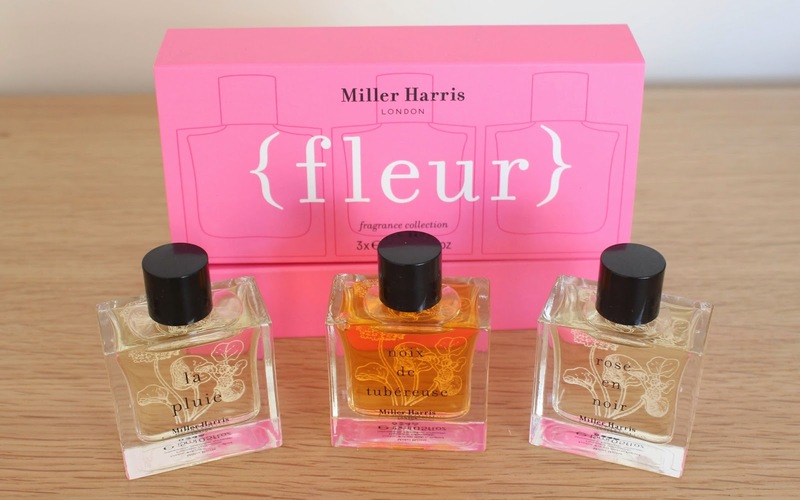 I have known of Miller Harris ever since one of my best friends was bought Fleur du Matin by her boyfriend a few years ago - I fell in love with it as much as she did though never owned it myself. I've been on the search for My Perfume for a while, you know, the one that suits me perfectly and that reminds people of me when they smell it [ha, sure, because obviously being reminded of me is super important. I jest]. I have tried and failed to find one from the standard big designer brands and in the back of my head I've always had Miller Harris (but perhaps not the money to indulge in it)... so it was for that reason that I was extremely excited to find this Fleur Trio Set* in my goodie bag from the QVC Autumn/Winter 2014 event last week. Honestly, I was so excited it even made it into my 100 Happy Days for that day! The set contains 15ml each of La Pluie, Noix de Tubereuse and Rose en Noir and comes in a little bright pink cardboard box. 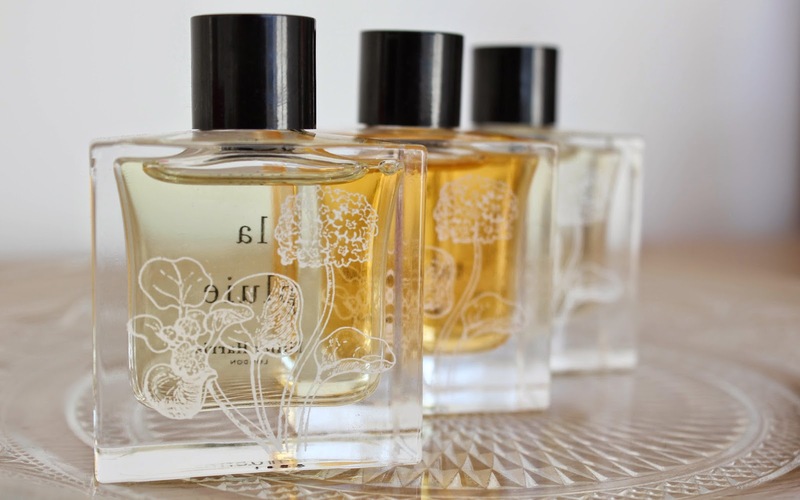 The bottles are just so gorgeous - even for mini bottles (which often in brands don't carry the same quality that the full size ones do) - they're heavy glass with beautiful flowers drawn on the back (I want to say they're fig... I could be wrong). La Pluie is poetically described as a 'story of tropical showers and the balmy climate of a faraway island' - isn't that just so perfect? From the description alone, without even smelling it, I love it! How many perfumes are described in such an exquisite way? It has top notes of bergamot, tangerine, lavender and wheat; the centrepiece or heart notes [I'm learning the lingo all the time] are ylang ylang, cassie, jasmine and Tunisian orange flowers. Finally the base notes are vetiver bourbon and vanilla bourbon. This is definitely my favourite of the three because it's the one I think is the freshest. It's a lovely daytime spring perfume that I know will be wafting around me in the coming weeks! 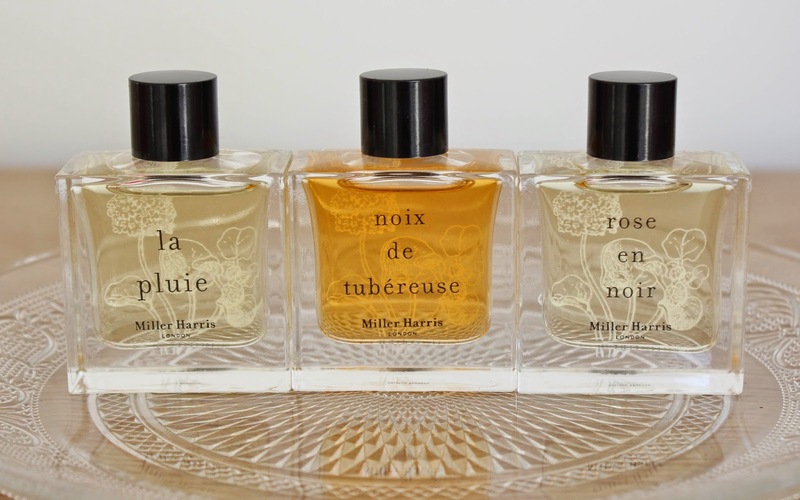 Noix de Tubereuse is 'inspired by one of the last remaining tuberose fields in Grasse'. Tuberose is a night-blooming flower which is commonly used for middle notes in perfume - however, it's the leaves that are the centre of this perfume. The base notes in this one are tonka bean, vanilla and amber; heart notes are tuberose, jasmine and mimosa; and finally top notes of mandarin, green clover and violet leaf. Grasse is significant because it's the world's capital of perfume [apparently, I just discovered this] - and particularly to Miller Harris because the founder Lyn Harris trained there. I would say that this one is more of an evening scent, but still springtime because it's quite light - there are so many notes in this that you can really understand why Miller Harris perfumes are so very special and beautifully, thoughtfully created. Rose en Noir is 'a velvety rich fragrance inspired by the sensual and dark side of the rose.' This is the most cologne-like of the three: Miller Harris perfumes aren't designed to be either for women or for men, but this one is probably the most likely to be a more masculine one. It's a super fresh one though, despite being the dark side of the rose. The top notes are raspberry, violet leaf and petitgrain; heart notes are rich and dark with Turkish rose, poivre noir and nutmeg; finally with base notes of patchouli, vetiver, tabac noir and ambrette seed. I love the fact that I've been able to try out three of these scents - and it's great to be able to mix them up, because if you just wear one your nose can become accustomed to it and it loses its power. 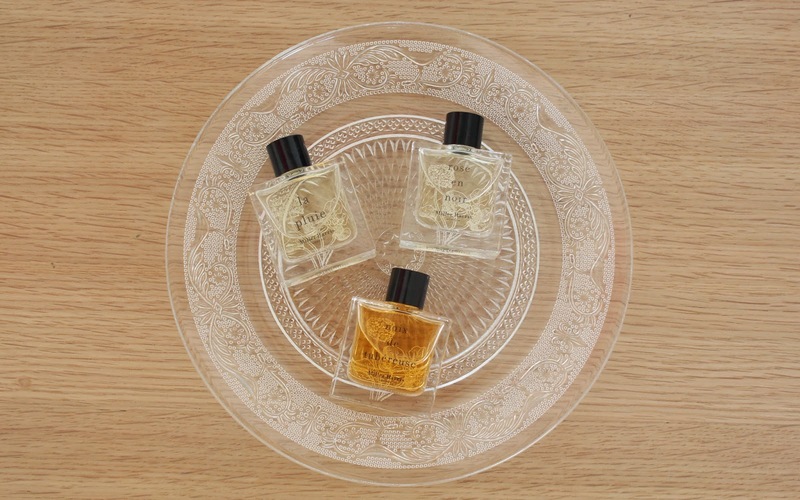 There are four different trios: Fleur, Citrus, Fruit and Wood (£50 for 3 x 15ml). Miller Harris perfumes are available from www.millerharris.com and some are online at www.qvcuk.com - the rest will be there in the autumn.